I've been to five out of the six, and this was the best one so far for me personally. One of the changes was to have the participants (who are learning how to run math circles) stick with a group of young people through the week. I facilitated the high school team. We had 8 adult participants, counting me, who ran math circles each afternoon for about 15 mostly high school age kids. Staying with one group of kids was great - we could really see the group of them coalescing over the course of the week. One thing that was missing was the beauty and skill the Kaplans bring to this event each year. (There was a health problem, and rest needed to recuperate, so they couldn't make it.) I expect them to be back - as good as ever - next year, and hope to once again have the best time ever next July. We got to all participate in a big math circle together each morning. On Monday, Sam Lichtenstein led us in an exploration of how much overhang you can get on a stack of dominoes. I had seen images of this sort of thing before, so I didn't start out hugely excited. But as we worked on it, my interest and excitement grew. I never felt like I had complete clarity on the physics involved, but we did come up with a mathematical solution that satisfied me. On Tuesday, Nathan got us working on a puzzle that started out with a hydra on our lawn. You probably know that if you cut off a hydra's head, it will grow two heads in place of the one. Our lawn began at the bottom left corner of a chessboard with an infinite number of spots upward and to the right. The hydra was in that first spot, and when we chopped its head off, it grew two new ones - one to its right, and one just above it. We could chop off one of those and again get heads to the right and above that one. The other head was now blocked, though. We used Othello boards to model the situation, and had lawns as shown. We got those two squares cleared and worked hard to clear the next diagonal. No one had yet done it when we gathered back together to discuss it. We went back and forth enthusiastically between trying to figure out how to do it, and trying to figure out a way to prove that we couldn't do it. Seems to me that's one sign of a good problem. A few of the high school age students attended morning sessions, and one of them wrote up a lovely solution to this problem - very clear and lively, with excellent illustrations. On Wednesday, Amanda led us in exploring Rational Tangles. Many of us had played with this amazing puzzle/game before, but I think everyone loved having another chance to explore. You need four volunteers, two ropes, and a caller. The dancers start, each holding a rope end, with the ropes parallel. On "turn 'em round", the group rotates 90 degrees, so everyone is in the position where the person to their left had been standing. On "do si do", the person at the back left holds up their rope and comes forward, with the person at the front left going under and to the back. The ropes get all tangled up after a few random calls. And if you know the number secret, you can always get them untangled! The mathematical thought that goes with this is delightfully tangled. On Thursday, Amanda led us through some interesting number puzzles. A number is onederful if it it composed of all ones in some (integer) base. 3 is onederful because it is represented as 11 in base two. Which numbers are onederful? Along with this exploration, we looked at divisibility rules: Why is a number divisible by 9 when its digits add up to a multiple of 9? What are the divisibility tests for 2, 3, 4, 5, and 6, and why do they work? 7 is the first number that has no really simple divisibility test. We came up with a great test together, by using modular arithmetic. I'm going to end this too long post here. Maybe later I can describe Friday's circle, and some of the evening entertainments. I enjoy the problems posted on the Five Triangles blog. It says they're appropriate for grades 6 to 8, but they are often hard enough to make me sweat a bit. This particular problem demanded to be solved, and made me sweat more than most. When I finally got a chance to look it over carefully, my first response was bewilderment. Then I had a few ideas, got out paper and pen, and drew some lines in. I was stuck again, but when I stated my new simpler problem carefully, and drew a new picture for it, I got it. To check, I used geogebra to construct it with just points, lines, and circles. 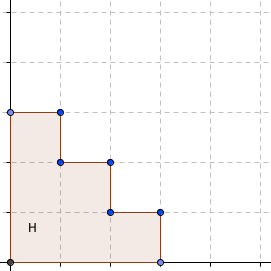 Playing with these problems makes me want to teach a geometry course. I liked high school geometry, but I've never taught a geometry course. And I feel limited when I try to do geometric constructions. Algebraic reasoning and coordinate graphs feel very natural to me. 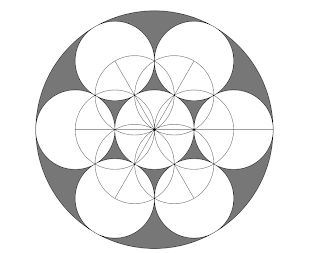 But the idea of constructing a pentagon, for instance, is a bit bewildering. 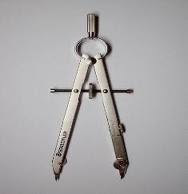 I'm a bit clumsy with a compass and straightedge - I often push the pencil into the device and have to fix it and try again. 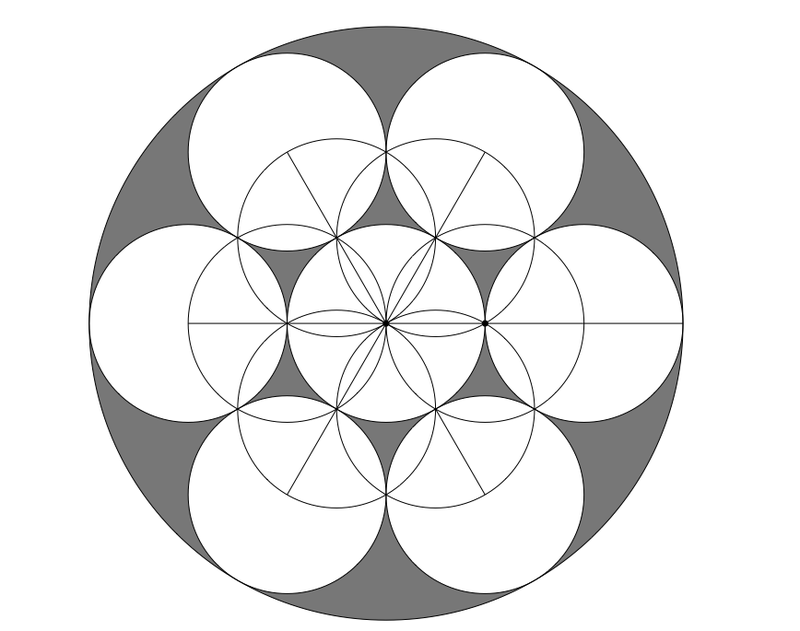 So a site that lets me play with geometric construction without the mechanical device sounded intriguing. The first time I heard about it (don't remember who, and don't know how to search my feedly reader the way I could with google reader), I tried it out and just got confused. There are minimal instructions on the site, and I just wasn't getting how to get started. So I went on to something else. The first 4 challenges involve constructing a triangle. If you make one at all, you've completed one challenge. If you make one inside the first circle you drew, you've completed another. And if you make one in 8 or fewer moves, you've completed yet another. The last of the set of 4 challenges is to make the triangle in 5 or fewer moves. So the 40 challenges involve constructing 10 figures. This is my construction of the 'circle pack 7'. It took me 17 moves, and there's a way to do it in 14. I think I'll return to this site often. Thanks, Nico! If you get excited about construction after playing here, and want a more flexible playground, you might like geometry toolbox.